Dan appeared on Good Morning America today to discuss the case of Cleveland kidnapper Ariel Castro, who will appear in court today where he is expected to be sentenced to life in prison, plus 1,000 years, as prosecutors released new details from his captives’ dairies. 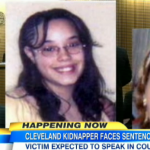 The sentencing memorandum, released yesterday, outlines dramatic details of how victims Amanda Berry, 27, Gina DeJesus, 23, and Michelle Knight, 32, were treated in captivity. Of what will happen, Dan said, “While this is a legal proceeding, we know what the outcome is. This is going to be primarily a crossing the ‘T’s, dotting the ‘I’s on the legal side, and then incredibly powerful on the emotional and human side… He can apologize, he could express remorse. He could try to explain himself. He might not do any of that. It doesn’t matter. He is going to serve the rest of his life behind bars without any chance of parole.” Watch the segment here.